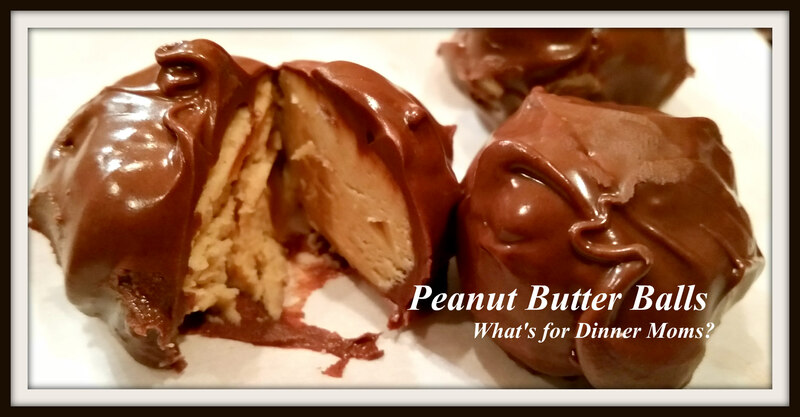 Peanut Butter Balls – What's for Dinner Moms? I hadn’t planned on it. I don’t care for peanut butter. It’s okay and I eat it maybe once or twice a month but my family is crazy for peanut butter. So, I decided to squeeze them in just for her. This is another cookie, I use that term very loosely with these as I think they are more candy than cookie, that goes by many names – Buckeyes, Buckeye Balls, Peanut Butter Balls, etc…. As you can see by my fingerprint on top of the right cookie and when I cut the cookie open so you could see the center they weren’t quite set yet. They get better when they have set and the chocolate has hardened. You want to make these on an afternoon or evening when you are not rushed and can coat them in chocolate without trying to get them done in 15 minutes. 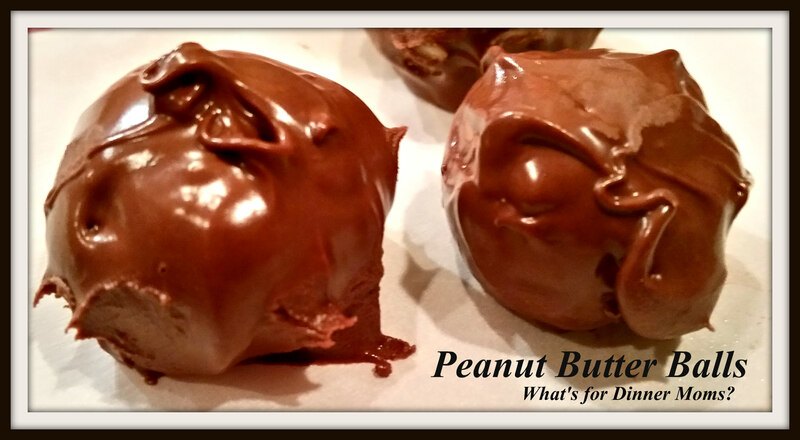 These are almost like peanut butter fudge coated in chocolate. There are many variations on this recipe adding crushed graham crackers, Rice Krispies, or nuts. I go for the plain and simple ones because my son is mostly gluten-free and when he was little these were the one treat I could make with him that wasn’t from a mix. Gluten-free mixes and ingredients have come a long way in the past 8 years! Cream together peanut butter and butter until well combined. Add in Confectioners sugar and vanilla to peanut butter mixture. Stir until well combined. Place a sheet of parchment on a baking sheet. Roll dough into 1″ balls. Once chocolate and paraffin are melted let them cool just a tiny bit. Working quickly with two spoons place one or two balls at a time in the pan and roll them in the chocolate. Remove back to parchment paper. If there are any open holes where the chocolate did not coat at the end drizzle a bit of chocolate over those spots. Place cookies in refrigerator for 20-30 minutes until set. Can be frozen once set. Can’t wait to make these for my hubby! They sound delicious and he loves his peanut butter! Paraffin? I haven’t used that before. What does it do? Paraffin softens the chocolate so it doesn’t crumble when you bite into it. It’s wax. With semi-sweet chocolate it tends to get really hard when layered and tough to bite into. Yes. Completely as long as you get the plain food safe. It is in the canning aisle usually. I learn something new from you all the time!! In the Midwest we call these Buckeyes. Yours look really good and I didn’t realize, having never made them, that the recipe called for paraffin. Thanks for stopping by The Fruitful Life and liking my recent post. We just moved to the Midwest a few years ago and I had to Google what Buckeyes were when I heard people refer to them because I knew they were not talking about football. In the Midwest, we call these Buckeyes. Yours look really good. I didn’t realize, having never made them, that the recipe calls for paraffin. Thanks for stopping by The Fruitful Life and liking my recent post. Reblogged this on Romantic Resonance.